In Chicago this week the big story (even bigger than the Illinois primaries) has been the retirement of Adam LaRoche, a designated hitter, first baseman for the Chicago White Sox. He walked away from a $13 million contract because the Sox management objected to the frequent presence of his 14-year-old son, Drake, at the team’s practices and games. Drake is being homeschooled so he has a lot of time to be with his Dad. He went to 120 Sox games last year, often traveling on the team charter plane. He has an official White Sox uniform and spent a lot of time in the clubhouse, which is off limits to the press and friends. It is the inner sanctum of the team. Adam LaRoche had informed the White Sox that he was close to his son and wanted to have him around frequently, but Sox management, especially Kenny Williams who is at the top of the team’s management group, reporting to the longtime owner Jerry Reinsdorf, was surprised and bothered by his almost constant presence at spring training in Arizona. When I heard about this case I found it shocking, that the 37-year-old La Roche, coming off a terrible 2015 season, would walk away from $13 million, which was most likely his last contract as a player. The case is fascinating to me for many reasons. I can see it from the White Sox point of view – overpaid player disrupts team chemistry. The son’s presence distracts Adam LaRoche. The locker room privacy is invaded by a teenager. LaRoche is an embarrassment to the management team that grossly overpaid for him. It was logical for the White Sox to get rid of the kid and possibly get the added benefit of nudging the father to abandon the fat contract. I would have thought the players would be relieved to have a “punk” kid and overpaid DH gone, but it has not played out that way so far. It appears that Drake LaRoche was a mature and respectful young man who was loved by some key players like a younger brother without family baggage. And his father Adam was a highly respected mentor who helped several players through work and personal problems last season. When Kenny Williams laid down the hammer on LaRoche’s son, thus prompting Adam’s resignation, he ignited a mini players’ rebellion led by the team’s star pitcher, Chris Sale. The chemistry of a sports team is fragile and fluid. Last year the Sox underperformed their talent while their Chicago rivals, the Cubs, overperformed. Williams may have been looking for the opportunity to shake up the team, but a shakeup can also make things even worse. It brings up personal issues for me. I worked summers for my father for six years, from the age of 17. To me it seemed like it never bothered anybody, but much of the time my father’s partner’s son, Dan, also worked. When my brother Jim joined the group things got more complicated in the office. My wife started working in her Dad’s law office when she was 15. She heard a lot of gossip amidst the paperwork. But I have no doubt that the presence of children in a family business in a visible position has the potential for disruption and jealousies. I was fearful of repercussions when my son Noah joined the staff of this publication which ultimately morphed into a position at Graff PInkert, the family machinery business. Ultimately, it did cause resentment for my brother. Family businesses and Major League baseball teams are not analogous but the LaRoche flap has similarities. At least as far as White Sox top management was concerned, Adam LaRoches’s son was ruining the chemistry of the team. A little of Drake LaRoche probably would have been okay. Adam had hung around some when his father Dave was a Major League pitcher and coach, but not for almost all of spring training and 120 games last year like Drake. This is a sticky problem for the Sox. How would you have played it? 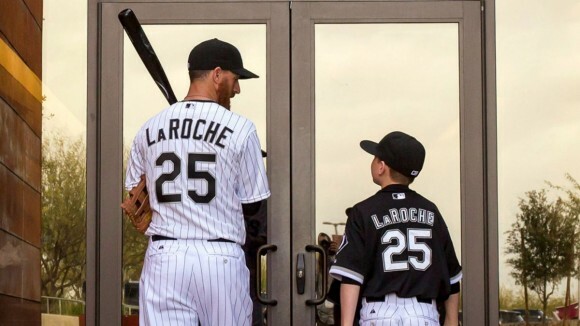 Question: Were the White Sox correct in expelling LaRoche’s son? Question: How do you feel about kids in the workplace? I don’t believe there is a right and wrong here. However, it is clear that there is an employer/employee relationship. Whether anyone likes it or not, the employer has the right and responsibility to define and enforce Policies and procedures. When an employee disagrees with a Policy or Procedure, he has the right to first, voice his opinion to his supervisor. If resolution is not found then the employee comes to a crossroad. His decision becomes his and his alone. Leave or comply. I think the Sox could have handled this more effectively, but we don’t know all the details of conversations that may have taken place. nothing wrong with this. If the boy is well behaved and out of the way at the games, I see no problem with this. The next time you see some rotten kids disrupting your day think about this. It’s not about the boy, it’s about money and waning abilities. When the agitation that caused waves is gone long enough, the waves will subside. As with a lot of things, there are a lot of “ifs” here. And I won’t go into them, everybody already knows them, and can likely add or subtract from any I would mention anyway. It was, ultimately, a management decision, and management DOES have that right, just as LaRoche had the right to bail over the issue. Whether management used the issue to push out a player that was in an unproductive streak we’ll never know, just like we’ll never know whether he would have come out of it on his own. The teams future performance will only be a partial barometer for whether this was a smart move, as there are a LOT of dynamics to be considered. Kids in the workplace. Hmm. Again, this depends on a lot of factors. But in a family owned business, like a great many shops are, it is often a fact of life. It’s success or failure is as varied as the situation. IF a kid is interested, and IF it is handled properly, it can be a great source of continuity in a shop. If the kid is seen as being privileged simply because if the family connection, it can be just as destructive. I’ve seen kids treated just like everyone else on the floor, expected to perform just like everyone else, and come on making a valuable contribution. I’ve seen kids constantly screwing up because they weren’t interested cause a huge dent in the attitude of floor workers. It all depends on the situation. My own son trained and worked with , taught , and luckily watched him make a very good hand, but he WAS interested. As kids today are likely to do, he turned out to be more adept at modern tech than I am, and when he outgrew our operation, went out on his own, and quickly moved into a position that would far eclipse my own, had he stayed at it. He chose to eventually go his own way, although he may go back to the shop at some time in the future. As I told him years ago. learn everything you can. Barring some traumatic brain injury, once you learn it, it can’t be taken away. So far, he seems to have learned that much, and figured out that it applies to music as well as machine work, as he’s at least feeding himself with his ability to play several different instruments, just like he used to do as much on several different types of machine tools. The machine tools had better benefits attached, but the music at his level is starting to show capacity for the same sort of benefits, so who knows? My point is IF you have your kids following you,maybe they will, maybe they won’t. If it’s YOUR shop, it’s YOUR business. Teach them the true nature of being in the business, then let them make their own decision, based on the real world they are looking at. But if you’re in somebody else’s shop, you may have somebody else’s interests to deal with. Call me old fashioned but kids have no place it the workplace. If there is a company run daycare that’s a different story. People are there to do a job whether it’s making widgets or swinging a bat. Even if the child is out of the way and well behaved, there is still the thought in the back of the parents head that the child is around and it’s a distraction. Why did you throw your brother into the mix at the end? Seems a little odd. I would’ve been more discreet. In a family business it’s logical that family will probably work there. The decision from the White Sox’s management seems appropriate. First mistake was agreeing to allow the son to be in the workplace, to start with. Especially when you are talking about a salary over 10 million. There is surely someone out there that can hit a baseball, catch a baseball, and run around the bases for 10 million plus dollars with a whole lot less baggage. Stupid on managements part to ever agree to something that did not contribute to the end result, in the first place. The money flows easy enough around professional sports that they continue to make stupid business decisions and survive. They should kiss & hug “tradition” every morning, noon, & night, because without “tradition” their product is not real good. I was running a lathe, drilling holes, making parts at the age of 7, and working here in the family business ever since. Almost 50 years years later I started my daughter running a conventional horizontal milling machine working her way into parts assembly and jobs in the office. She is the official paper shredder operator. This starts children off with some responsibilities, satisfaction, rewards for a job well done and good self esteem in addition to a work ethic. You won’t reply to my emails so I have to ask here. Why are you blocking me from your blog. I’m posting this from a different computer. Far as your question goes. They never should have let it get this far out of hand. Troll: A person who sows discord on the Internet by starting arguments or upsetting people, by posting inflammatory, extraneous, or off-topic messages in an online community (such as a newsgroup, forum, chat room, or blog) with the deliberate intent of provoking readers into an emotional response or of otherwise disrupting normal on-topic discussion, often for their own amusement. Been participating in this blog for many months, then one day I was blocked, with no reason given. Look back you will see many posts from me.